Another useful hack. We have macs at my house. All my roommates have macs. Not one pc in the bunch. The only way I’ve been able to BBS at home is using the Comet, hooked to the mac, using the mac’s wifi, and using the Ethernet cable to chain to the Comet. But I’m stuck at 2400 baud with that solution. So, I figured, instead of the comet, let’s get a simple Raspberry PI Solution going. TCPSER can do ANY Baud Rate I want, and pl2303 devices (such as the Strikelink or any other Serial<>USB Device) do not need additional drivers for the PI – they’re already included in the raspbian distro. It’s Built into the system. so let’s give it a shot. Installing TCPSER is easy on the PI. If you haven’t done it yet. -d is the device. Yours should be at ttyUSB0, but in case it doesnt work, try USB1, 2, etc. -p is the port. -s is the speed. Strikelink Ultra does 9600 so use that option. -s 38400 for swiftlink/turbo232 etc. -l 4 is the logging level, i always use this. Plug her in and you’ve got a cheap solution based out of a pi. That took 15 minutes to get running, way better than trying to get the mac rolling. Enjoy! Posted in Striketerm, Term programs. This method is good for calling bbs systems, but not hosting a bbs. Vidkid’s hack has this figured out. The max baud rate for now is 2400. This pertains to installations of Vice 2.4 with the SDL Library. Make sure netcat and tcpser are both on your linux/pi. 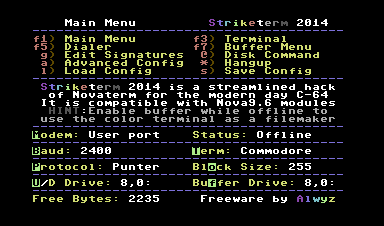 That’s it, go back to terminal, makesure your term program is using a standard hayes/user port setup (In Striketerm it’s the User Port modem), 2400 baud, type AT in terminal and you should get an ok! Final version (for now) of Striketerm. All known bugs have been fixed. Please feel free to reach me if you find more. The 2015 edition is now in development. Though I’m not sure which, if any useful features, could be added. Enjoy!